The UK government commissioned Prof Greg Brookes to study all of the different interventions available for struggling readers. The Easyread System received one of the top ratings. You can download his report “What works for children and young people with literacy difficulties”. 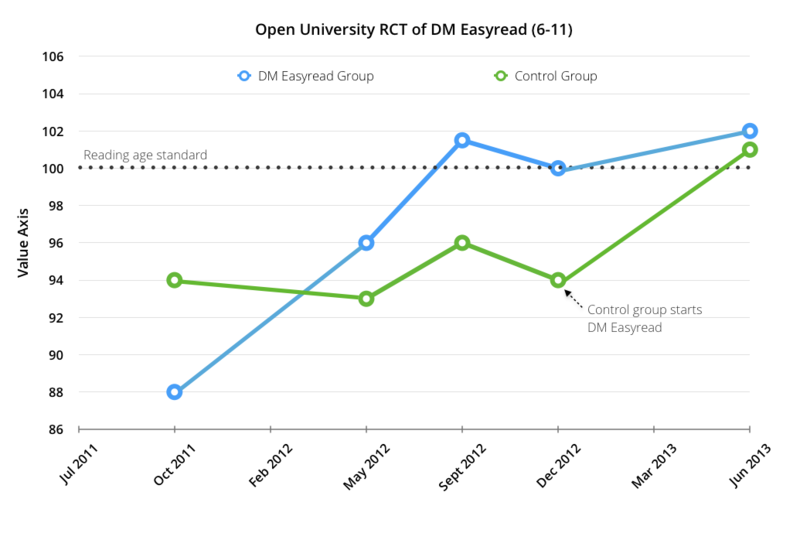 The Open University collected data on Easyread in six London schools between October 2011 and June 2013, through a randomized control trial (RCT). The trial was managed by Professor David Messer with the assistance of Dr Gilly Nash. Results show that children who were on average 2 years behind in reading age caught up to the national standard within 120 lessons. That’s an average gain of 2 years reading age in around 6 months of daily lessons. You can see the published article in the Journal of Research in Reading. In 2019 it was shortlisted for an award for exemplary literacy research! 100 children were assigned randomly to an Easyread Group and a Control Group. During the trial some of the most challenged readers in the Control Group left their respective schools (perhaps in frustration at not being included in the first wave of Easyread intervention!). Meanwhile some of the best readers from the Easyread group also left their schools. So the two groups ended up showing a different average start point, despite being originally equal, where the Easyread group had a lower initial reading age. Over the first 12 months, the Easyread Group actually reached a normal reading level for their age after doing around 120 lessons. Meanwhile the majority of the Control Group continued to fall behind expectation. 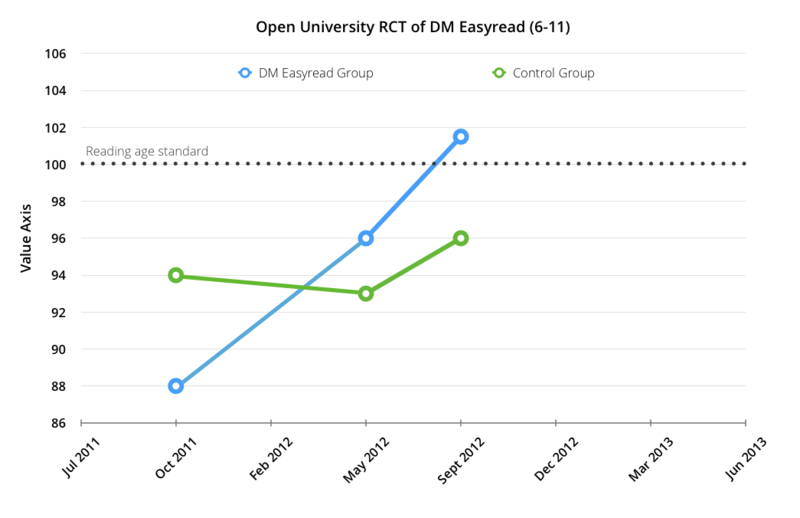 The trial continued and in January 2013 the children of the Control Group were also put on Easyread. By June 2013 the Control group had done around 50 lessons, and caught up to the national standard too. The Easyread system was built upon years of background research into the neurology of literacy, dyslexia, visual processing, and phonics. We are constantly reading new material to stay current, and are always happy to share reading recommendations if you are interested in diving deeper. Click for a full reading reading list to get you started. Easyread received one of the strongest recommendations in a governmental review of literacy interventions.